We are committed to protecting your privacy. Authorized employees within the company on a need to know basis only use any information collected from individual customers. We constantly review our systems and data to ensure the best possible service to our customers. We do not and will never give, sell, or disclose your personal information to a third party for any reason. SRS, its affiliates, agents, and employees, and all persons acting on its or their behalf (collectively, SRS), disclaim any and all liability for any errors, inaccuracies or incompleteness contained in any datasheet or in any other disclosure relating to any product. SRS makes no warranty, representation or guarantee regarding the suitability of the products for any particular purpose or the continuing production of any product. To the maximum extent permitted by applicable law, SRS disclaims (i) any and all liability arising out of the application or use of any product, (ii) any and all liability, including without limitation special, consequential or incidental damages, and (iii) any and all implied warranties, including warranties of fitness for particular purpose, non-infringement and merchantability. Statements regarding the suitability of products for certain types of applications are based on SRS's knowledge of typical requirements that are often placed on said products in generic applications. Such statements are not binding statements about the suitability of products for a particular application. It is the customer's responsibility to validate that a particular product with the properties described in the product specification is suitable for use in a particular application. Parameters provided in datasheets and/or specifications may vary in different applications and performance may vary over time. All operating parameters, including typical parameters, must be validated for each customer application by the customer's technical experts. Product specifications do not expand or otherwise modify SRS's terms and conditions of purchase, including but not limited to the warranty expressed therein. SRS products are not designed for use in medical, life-saving, or life-sustaining applications or for any other application in which the failure of the product could result in personal injury or death. Customers using or selling SRS products not expressly indicated for use in such applications do so at their own risk. No license, express or implied, by estoppel or otherwise, to any intellectual property rights is granted by this document or by any conduct of SRS. Product names and markings noted herein may be trademarks of their respective owners. Cash or Money Orders (US Banks or International Postal Money Orders only, written in USD), all major Credit/Debit Cards via PayPal are all acceptable methods of payment. Our Terms are payment in full upon ordering. No orders will be shipped if any part of the order total is outstanding. Orders are generally shipped very quickly, usually within 24 hours. Once an order has been shipped, it cannot be canceled or changed. It is best to contact us ASAP if you need to cancel or modify an order. We are a stocking warehouse. Most items are available for immediate shipment. In the rare instance when an item is not available for immediate shipment, we will do our best to have it drop-shipped from one of our suppliers within the same timeframe as if we had shipped it ourselves. Please understand that shipping delays in the shipping system itself are out of our control, and many economy shipping methods do not advertise nor guarantee a specific delivery timeframe or date of delivery. If your order is time-sensitive, please contact us prior to making a purchase to receive quotes on shipping services with guaranteed delivery dates. Occasionally, an item may be temporarily out of stock, or an item in our catalog may be discontinued by the manufacturer. Backordered items in a quantity of less than one third of the total value of an order will be canceled and the remaining order shipped immediately, unless the backorder condition is expected to be remedied within 3-5 business days. On time-sensitive orders, we will notify you immediately of any backorder or out of stock condition. If an item has been discontinued, we can not be responsible for filling orders for quantities larger than our stock on hand. All orders are shipped FOB, NY USA. Buyer is responsible for shipping costs as stated on the website or quoted prior to purchase. These shipping costs include the cost of protective packing materials, actual shipping/handling costs, and insurance as deemed necessary by the shipper, and are not negotiable. International orders are welcome- please contact us for shipping quotes prior to purchase, as there are requirements by most payment processing companies with regards to tracking and proof of delivery, and some economy shipping methods are not acceptable to them due to lack of proper tracking. There is a 14-day window for returns from time of purchase. Returned items must be in new and perfect condition including all packaging, are subject to a 20% restocking fee, with the remaining balance given as store credit only. Items returned as defective will be exchanged for an identical replacement item only; no substitutions allowed. Shipping and handling costs are non-refundable once an order has entered the shipping system. Return shipping costs and arrangements are the responsibility of the purchaser. 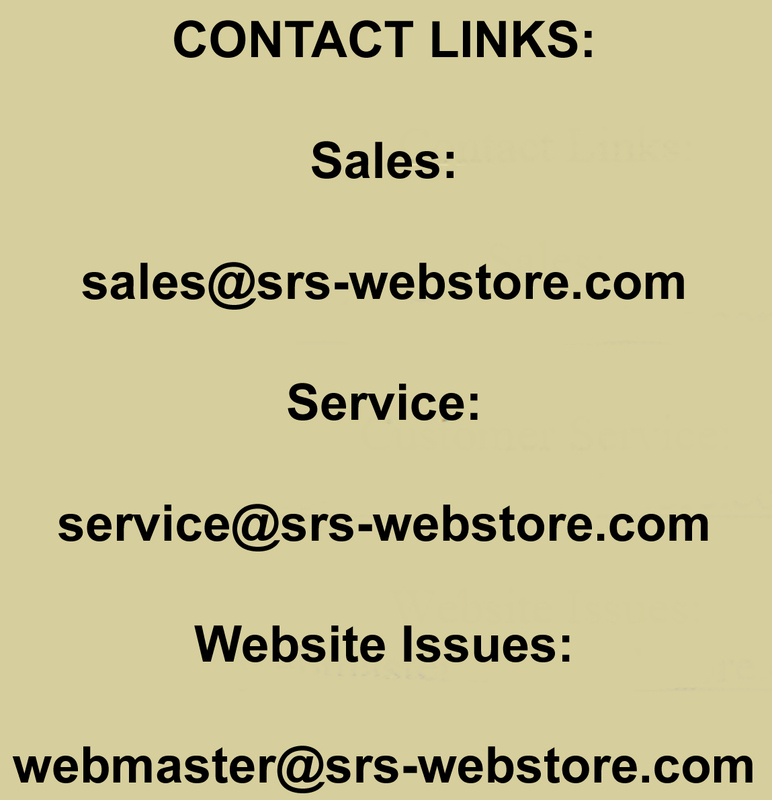 Customer must contact SRS to obtain an RMA number prior to returning any product. Return shipments with no RMA displayed will be refused. Due to the fact that there are many variables involved in correct setup and maintenance of tube amplification equipment, matched output tube sets carry a 30-day DOA warranty only. Any issues related to tube failure after 30 days have passed from time of purchase must be addressed with the tube manufacturer directly. Due to the fact that they can not be returned to stock and sold as new to another customer, there are no returns accepted on electronic components once installed. Items which need to be cut to size for a customer such as textiles, bulk cable, etc. are not returnable. Test equipment is excluded from our return policy. It is warrantied to be free of manufacturer defects upon delivery and for proper function for it's intended purpose. No refunds or exchanges for a different type of device. Should test equipment manufactured by SRS be found to have a manufacturer defect within 30 days of purchase, it will be repaired or replaced with an identical item only, at the sole discretion of SRS. These terms and conditions form part of the Agreement between the Client and ourselves. Your accessing of this website and/or undertaking of a purchase indicates your understanding, agreement to and acceptance, of the Disclaimer Notice and the full Terms and Conditions contained herein.